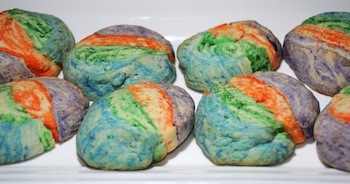 Using a sugar cookie dough recipe you can create some fun tie dye inspired cookies. 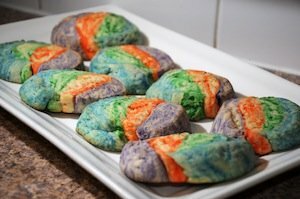 We'll show you how to make tie dye cookies and how to make these ideas into theme cooking activities. Prep your sugar cookie dough and divide dough into 3-4 sections depending on how many colors you'd like to work with we've done 4 here. 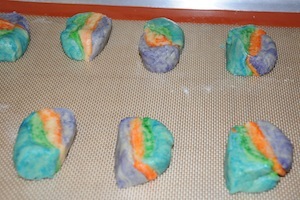 Add a drop of food coloring of your choice to each of the cookie sections and knead the color in. If you'd like a marbled effect like we have don't knead too long just enough to have a swirled color effect. 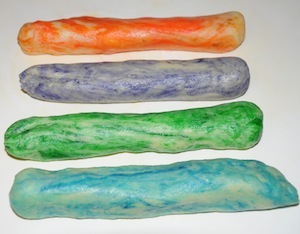 Roll each color into a log. Stack on top of each other and twist colors together. Slice cookies about 1/2 inch thick and place on a cookie sheet. Bake at 375 degrees F for 8-10 minutes until you see bottoms turning golden brown. 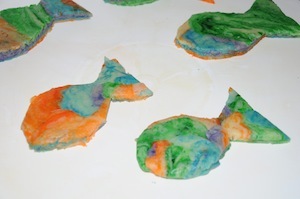 Using a *fish cookie cutter cut out fish shapes from cookie dough and place on cookie sheet. Bake at 375 degrees F for 8-10 minutes until you see bottoms turning golden brown. *We didn't have a fish cookie cutter so used a piece of heavy cardstock and cut out a simple fish pattern. 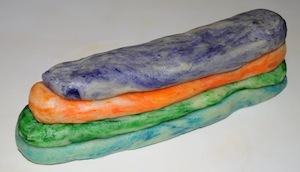 Combine this cooking activity with the book Rainbow Fish for a cooking and reading experience. 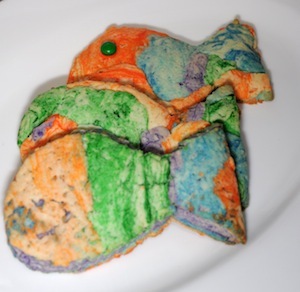 Easter egg cookies or a cookie decorating party. 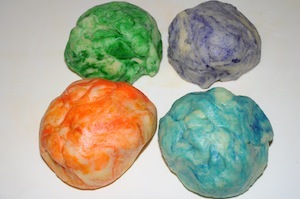 Try this similar recipe for Tie Dye Cupcakes.